Waves of frilly, vibrant flowers make a realy head-turning feature in your garden. 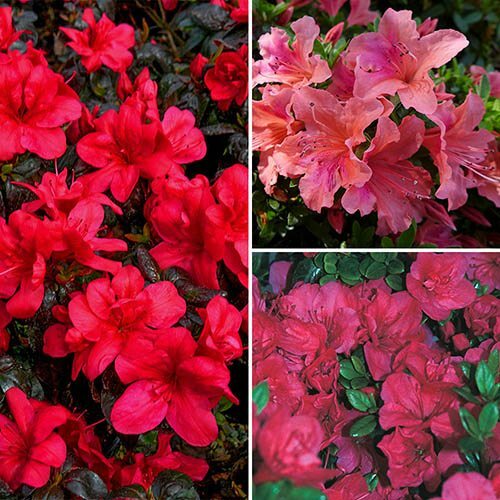 A collection of three stunning Azaleas to give you vibrant blooms in spring and year-round, evergreen foliage interest. Contrasting with the gorgeous flowers, the evergreen leaves are glossy green and provide a good foil for other plants such as colourful perennials. 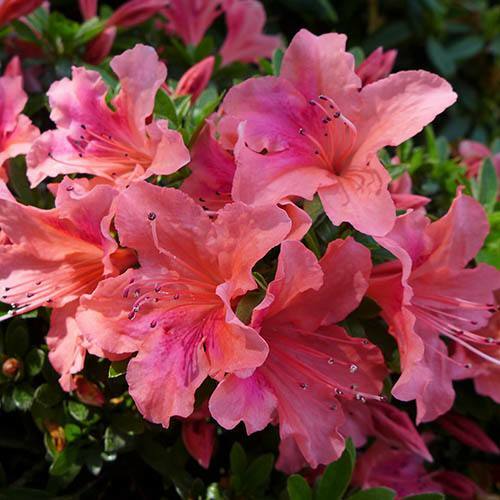 Azaleas thrive in moist soil and partial shade and need acidic soil, so incorporate plenty of ericaceous compost to the planting hole or container. Ideal to provide masses of colour in early spring, plants can also be grown in a pot (remember to use ericaceous compost) and benefit from regular watering and feeding. Supplied as a collection of 3 plants in 2L pots, 1 each of Marushka, Pink Pancake and Purple Cushion. Contrasting with the gorgeous flowers, the evergreen leaves are glossy green and provide a good foil for other plants such as colourful perennials - which will also give another layer of planting to your garden. Growing to around 45-100cm (18 - 40in) high and wide, depending on variety, Azaleas are ideally suited to container growing, and this will also help to keep them compact and of course easy to maintain. Perfect for providing masses of colour in early spring, Azaleas thrive in moist soil and partial shade, and need acidic soil, so incorporate plenty of ericaceous compost to the planting hole or container when planting. 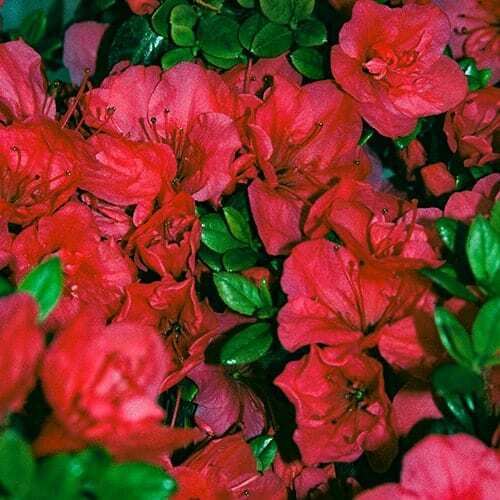 An evergreen azalea with light red flowers, marked deeper red in the throat. The dark green foliage transforms to a wonderful bronze in winter, adding winter interest wherever it's planted. Ideal for containers. Flowers mid-May. Height 40cm (16in) and spread 60cm (24in) approx. This gorgeous evergreen azalea with large frilly pink flowers. Ideal for baskets, tubs, and raised beds, where its flattened habit will cascade over edges - hence its name, 'Pancake'. Flowers in June-July. Height 75cm (30in) and spread 90cm (36in) approx. An evergreen Azalea which forms a cushion of leaves, this free flowering variety is low maintenance and will virtually look after itself. An ideal choice for planting in containers or the front of borders. Flowers mid-May. Height: 75cm (30in) and spread 1m (39in) approx. Supplied as a collection of 3 plants in 2L pots, 1 each of Marushka, Pink Pancake and Purple Cushion. Plant them at the front of acid borders or in containers of ericaceous compost. Can be kept in a pot (remember to use ericaceous compost) but must be fed and watered well and re-potted every couple of years. Azaleas can tolerate a more open site as long as they are sheltered from cold, drying winds and early morning sunlight. Mulch plants and water deeply and regularly during dryer periods from July onwards. Your Azalea should be planted slightly higher than it was in its pot into well-draining soil. 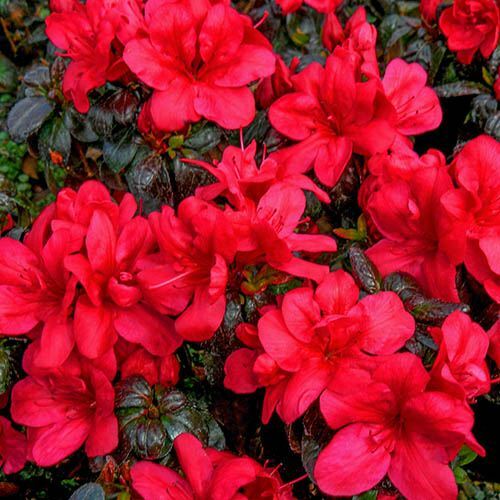 Azaleas need an acidic soil with a pH of around 5.5 in order to thrive - soils with pH higher than 5.5 should be acidified before planting or you can grow them in a container with ericaceous compost. When watering, try to use rainwater as tap water tends to be too hard and more alkaline. Plants benefit from a yearly feed, and our Azalea, Rhododendron and Shrub feed it the ideal formulation.